It’s taken for granted that rehabilitation is part of the recovery process for many medical conditions, yet pulmonary rehabilitation for people with lung cancer is rarely prescribed. The reason is not a lack of efficacy—rehab can make a significant difference for some people with lung cancer. We don’t have as much information about its role with lung cancer, but pulmonary rehabilitation for people with COPD has recently become recognized as an essential part of a COPD treatment plan. When can pulmonary rehab help, and what should you know when you talk to your doctor? Pulmonary rehabilitation is a coordinated approach to improving quality of life that uses the expertise of several specialties. Some of these include respiratory therapists, physical therapists, occupational therapists, nutritionists, psychologists, exercise physiologists, and more. Even though "breathing easier" might be one goal of rehab, we know that many factors work together to improve or impede quality of life in people with cancer. Pulmonary rehabilitation is different than chest physical therapy (also called chest physiotherapy). Chest physical therapy involves techniques used to remove excess mucus from the lungs. A walk test. Before beginning rehab, a therapist will often check your baseline lung function tests. She may also do something called a 6-minute walk test which will look at the distance you can walk on a firm surface for 6 minutes comfortably. Instruction in breathing techniques. For example, the technique known as diaphragmatic breathing to strengthen the diaphragm and decrease the fatigue of breathing, and pursed-lip breathing to help decrease the sensation of shortness of breath. Energy conserving techniques. This may include ways to be more active with less shortness of breath. For example, you may be instructed on tips for avoiding shortness of breath while eating. Instruction in the use of medications to help breathing. Aerobic exercise such as walking on a treadmill or using an exercise bike to improve endurance and increase lung capacity. Weightlifting to build strength in breathing muscles. Training respiratory muscles to assist respiration. Relaxation techniques and coping strategies. Psychological support to help you understand how emotions and psychological stress can affect your breathing. Improve the ability to exercise and do day to day activities. Lessen complications of lung cancer surgery (see below). Improve co-existing medical conditions. It’s not uncommon for people with lung cancer to also have emphysema and chronic bronchitis. Studies have found that in these people, pulmonary rehab results in less shortness of breath, better exercise performance, and better health-related quality of life. Decrease complications following surgery. Complications from lung cancer surgery are common and may include prolonged ventilator dependence, infections, bleeding, heart problems, blood clots, post-thoracotomy pain syndrome, and more. Improve breathing so that potentially curative lung cancer surgery can be done. Possibly improve outcomes after lung cancer surgery. A few small studies found that people who had rehab before surgery had shorter hospital stays, less morbidity (that means sickness) near the time of surgery, and had a shorter duration of needing a chest tube following surgery. Your oncologist, thoracic surgeon, or pulmonologist will need to work with you to determine the best time for pulmonary rehabilitation. One study found that rehab shortly after thoracotomy resulted in increased pain, and suggested that it might be better to wait 3 or 4 months after major chest surgery to begin rehab. What About People With Inoperable Lung Cancer? Even people with advanced lung cancer may benefit from pulmonary rehab. In addition, many people with stage 4 disease do not have surgery and therefore may be able to begin a rehab program right away without waiting for surgical incisions to heal. In California, the California Society for Pulmonary Rehabilitation has a list you can search for providers. In Canada, the Canadian Lung Association has a list of pulmonary rehab programs. In the U.K., you can check with the British Lung Foundation regarding rehab sources. Risks associated with pulmonary rehabilitation are primarily the risks inherent with any exercise program. If someone has unstable heart disease, exercise can increase the risk of abnormal heart rhythms or heart attacks. For people with osteoporosis, the risk of bone injury should be considered. This is also important to consider if you have bone metastases. For those on chemotherapy, the risk of infection when in contact with others should be considered. For people who have had surgery, it’s important that the surgical site is well healed to avoid the risk of a surgical incision opening. It’s important to check with your insurance provider to see what will be covered by your particular plan. If treatment is not covered, you may want to consider entering one of the clinical trials that are studying the benefit of pulmonary rehab for people with lung cancer. If you aren’t sure where to start, there is the Lung Cancer Clinical Trial Matching Service that provides free help in searching clinical trials available worldwide. Part of the reason is a lack of awareness about these services even by physicians. Research has also cited long waiting lists as one reason. 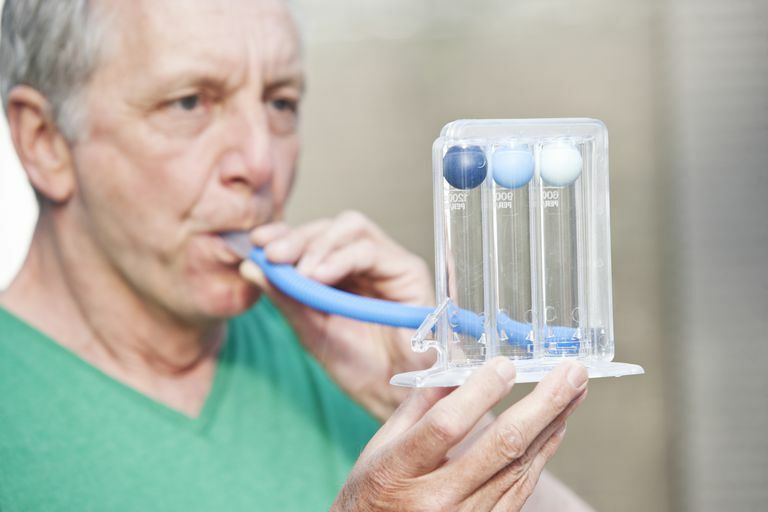 A major reason is that the benefits of rehabilitation for people with lung cancer is just beginning to be studied as it has been for other conditions such as COPD. With many medical conditions we're learning that rehabilitation can make a tremendous difference in quality of life. For those who have had a heart attack, stroke, or hip replacement, it's become almost routine. But we are only begin to learn about the possible benefits for people with lung cancer. When done before lung surgery, it appears that pulmonary rehabilitation can reduce some of the common complications. Even those who have advanced lung cancer have been found to benefit. If you haven't been offered rehab, talk to your physicians. You may need to be your own advocate and bring up the possibility at this stage, though it's likely that rehab will become much more routine in the future. Cavalheri, V., and C. Granger. Preoperative Exercise Training for Patients with Non-Small Cell Lung Cancer. Cochrane Database of Systematic Reviews. 2017. 6:CD010202. Glattki, G. et al. Pulmonary rehabilitation in non-small cell lung cancer patients after completion of treatment. American Journal of Clinical Oncology. 2012. 35(2):120-5. Morano, M. et al. Preoperative pulmonary rehabilitation versus chest physical therapy in patients undergoing lung cancer resection: a pilot randomized controlled trial. Archives of Physical Medicine and Rehabilitation. 2013. 94(1):53-8. Rivas-Perez, J., and P. Nana-Sinkam. Integrating pulmonary rehabilitation into the multidisciplinary management of lung cancer: a review. Respiratory Medicine. 2015. 109(4):437-42. Schmidt-Hansen, M., Page, R., and E. Hasler. The effect of preoperative smoking cessation or preoperative pulmonary rehabilitation on outcomes after lung cancer surgery: a systematic review. Clinical Lung Cancer. 2013. 14(2):96-102. Shannon, V. Role of pulmonary rehabilitation in the management of patients with lung cancer. Current Opinions in Pulmonary Medicine. 2010. 16(4):334-9. Stiqt, J. et al. A randomized controlled trial of postthoracotomy pulmonary rehabilitation in patients with resectable lung cancer. Journal of Thoracic Oncology. 2013. 8(2):214-21.